Bryan Cranston as Walter White. Walter Hartwell White Sr., also known by his clandestine alias Heisenberg, is a fictional character and the main protagonist of Breaking Bad. He is portrayed by Bryan Cranston. A chemistry honors graduate of the California Institute of Technology, Walt co-founded the company Gray Matter Technologies with his close friend Elliott Schwartz and his then-girlfriend Gretchen. He left Gray Matter abruptly, selling his shares for $5,000; soon afterward, the company made a fortune, much of it from his research. Walt subsequently moved to Albuquerque, New Mexico, where he became a high school chemistry teacher. Breaking Bad begins on Walt's 50th birthday, when he is diagnosed with Stage IIIA lung cancer. After this discovery, he resorts to manufacturing methamphetamine and drug dealing to ensure his family's financial security after his death. He is pulled deeper into the illicit drug trade, becoming more and more ruthless as the series progresses, and later adopts the alias "Heisenberg", which becomes recognizable as the kingpin figure in the local drug trade. Series creator Vince Gilligan has described his goal with Walter White as "turning Mr. Chips into Scarface", and deliberately made the character less sympathetic over the course of the series. Walt's evolution from mild-mannered school teacher and family man to ruthless criminal mastermind and murderer is the show's central focus. Although AMC officials initially hesitated to cast Cranston due to his previous comedic role on Malcolm in the Middle, Gilligan cast him based on the actor's past performance in the X-Files episode "Drive", which Gilligan wrote. Cranston contributed greatly to the creation of his character, including Walt's backstory, physical appearance, and personality traits. Both the Walter White character and Bryan Cranston's performance have received critical acclaim, with White frequently being mentioned as one of the greatest and most iconic television characters of all time. Cranston won four Primetime Emmy Awards for Outstanding Lead Actor in a Drama Series, three of them being consecutive, becoming the second actor to do so, after Bill Cosby for I Spy in the 1960s. Following his fourth win, Cranston tied Dennis Franz for the most wins in the category's history. He is the first man to win a Critics' Choice, Golden Globe, Primetime Emmy, SAG, and TCA Award for his performance. In the Spanish-language remake Metástasis, his character is renamed Walter Blanco (blanco being the Spanish translation of white) and is portrayed by Diego Trujillo. Walter White was an only child. Walt's father died of Huntington's disease when he was six years old. He studied chemistry at the California Institute of Technology, where he conducted research on proton radiography that helped a team win a Nobel Prize in Chemistry in 1985. After graduate school, Walt founded the firm Gray Matter Technologies with Elliott Schwartz (Adam Godley), his former classmate and close friend. Around this time, Walt dated his lab assistant, Gretchen (Jessica Hecht). He left both Gretchen and Gray Matter Technologies, selling his financial interest in the company for $5,000. Gretchen and Elliott later married and made a fortune, much of it from Walt's research. Though they remain friendly, Walt secretly resents both Gretchen and Elliott for profiting from his work. At the age of 50, Walt works as a high school chemistry teacher in Albuquerque, New Mexico, providing instruction to uninterested and disrespectful students. The job pays so poorly that Walt is forced to take another job at a local car wash to supplement his income, which proves to be particularly humiliating when he has to clean the cars of his own students. Walt and his wife Skyler (Anna Gunn) have a teenage son named Walter Jr. (RJ Mitte), who has cerebral palsy. Skyler is also pregnant with their second child, Holly, who is born at the end of season two. Walt's other family includes Skyler's sister, Marie Schrader (Betsy Brandt); her husband, Hank (Dean Norris), who is a DEA agent; and his mother, who is never seen. On Walt's 50th birthday, during his surprise party, he watches a news report about Hank arresting methamphetamine dealers. Walt is impressed by the monetary returns from the meth operation, and Hank offers to take him as a ride-along to a DEA bust. The next day, Walt faints at the car wash and is taken to a hospital; there, he is told he has inoperable lung cancer and will likely die in two years. During the ride-along, Hank busts a crystal meth lab, taking cook Emilio Koyama (John Koyama) into custody. Walt sees Emilio's partner fleeing the scene; it is one of his former students, Jesse Pinkman (Aaron Paul). Looking to secure his family's well-being by producing and selling meth, Walt tracks Jesse down and blackmails him into selling the meth that Walt will cook. Walt gives Jesse his life savings to buy an RV that they can use as a rolling meth lab. After their first cook in the RV, Jesse brings a sample of the extremely pure meth to distributor Domingo "Krazy-8" Molina (Max Arciniega), and then brings Krazy-8 and the now-released Emilio to see the cook site. Emilio recognizes Walt as accompanying the DEA during the bust, and believes he is an informant. Krazy-8 forces Walt to show them how he cooked such pure meth or be killed. Walt pretends to start a cook but instead produces toxic phosphine gas which kills Emilio and incapacitates Krazy-8. Walt and Jesse secure Krazy-8 to a support beam in Jesse's basement with a U-lock around his neck, and Walt struggles with the decision on whether to kill him. After Krazy-8 promises not to retaliate, Walt starts to unlock the lock to let Krazy-8 go, but sees him reach for a broken piece of plate to stab Walt with as soon as he was freed. Walt panics and garrotes him to death with the lock. The experience shakes Walt, and he tells Jesse he will not cook meth anymore. Walt eventually tells his family about his cancer diagnosis, and they urge him to undergo expensive chemotherapy. He initially does not want to go through the treatment, fearing that his family will remember him as a burden and a helpless invalid, much as he remembers his own father. Later he relents and agrees to undergo treatment, but refuses Gretchen and Elliot's offer to pay for it, choosing to re-enter the drug trade with Jesse. He shaves his head to hide his chemotherapy-induced hair loss. Dissatisfied with Jesse's slow pace of selling the meth, Walt pushes him to sell it in bulk to local drug lord Tuco Salamanca (Raymond Cruz), who has taken over Krazy-8's former territory. Discovering that Tuco stole the meth and savagely beat Jesse, Walt visits Tuco's lair with another bag of crystals, claiming to be "Heisenberg" (a reference to the theoretical physicist Werner Karl Heisenberg). After Tuco mocks Jesse, refuses to pay for the bag, and implies that Walt will suffer the same fate as Jesse, Walt blows up part of the lair; the bag contained fulminated mercury, not meth. Impressed by the boldness of "Heisenberg", Tuco reluctantly agrees to pay for his meth upon delivery in the future. Walt revels in his success and adopts the Heisenberg alias in his business dealings going forward. In order to make larger batches of meth to take advantage of their new arrangement with Tuco, Walt and Jesse switch from using pseudoephedrine to methylamine as a precursor. This tints their meth blue, which becomes a signature of Walt's product. The pair begin to fear for their lives when, after testing the purity of the meth they delivered by snorting some of it, Tuco senselessly beats to death one of his own men, No-Doze (Cesar Garcia). Walt's "blue meth" becomes incredibly popular, to the point that Hank takes notice and raids Tuco's operation. A paranoid Tuco evades the bust, carjacks Jesse, and kidnaps Walt. He brings them to an isolated house in the desert, planning to take them deep into Mexico where they would be forced to cook the blue meth. After a failed attempt to poison Tuco, they manage to escape on foot. Hank, who had been searching for Jesse, spots his car at the house and kills Tuco in a gunfight. Walt is arrested when he takes off all his clothes in a grocery store. He explains his disappearance by claiming that he had gone into a fugue state as a result of his cancer medication and simply wandered off. Walt finds out that his cancer is in remission, and plans to leave the meth business again after selling the final 38 lb (17 kg) of meth. He hires unscrupulous criminal attorney Saul Goodman (Bob Odenkirk) to cover his involvement in the drug trade and launder his drug money. Seeing they need a new distributor to sell the large quantity of product they have remaining, Saul arranges a meeting at a local restaurant with a mysterious meth kingpin. Jesse shows up for the meeting high on heroin, and leaves when the kingpin does not show. Walt realizes that the restaurant owner, Gus Fring (Giancarlo Esposito) was the man they were supposed to meet. Under questioning by Walt, Gus explains that he was observing the pair, and refuses to work with them because Jesse is a drug addict. However, a few days later he gives Walt a chance to prove himself by delivering all the meth to a truck stop within an hour. Walt breaks into Jesse's apartment where the meth is stored, and finds him passed out with his girlfriend Jane Margolis (Krysten Ritter). Walt finds the meth and makes the delivery on time, but misses the birth of his daughter. Jane blackmails Walt into giving Jesse his share of their drug money, after Walt initially refused due to Jesse's drug use. After talking to a stranger at a bar about family – not knowing that the man is Jane's father Donald (John de Lancie) – Walt again breaks into Jesse's apartment to find the lovers passed out in a heroin stupor. Jane rolls onto her back, vomits, and begins to choke. Walt does nothing to help her, and watches her die. Walt has Saul's cleaner, Mike Ehrmantraut (Jonathan Banks), clear any connection Jesse has to Jane's death, and convinces Jesse to enter rehab. Walt undergoes an operation to remove the remaining cancerous growth. Walt's anesthesia-induced references to a "second cell phone" – the one he uses to deal drugs – makes Skyler suspicious, leading her to uncover many of his lies and leave with their children. Just after her departure, two passenger planes collide directly above Walt's house; the accident was caused by Donald, who works as an air traffic controller and was so overcome with grief that he was not paying attention to his work. Walt watches the accident in horror, unaware that he is indirectly responsible for it. Walt decides to get out of the meth business, refusing Gus' offer to produce meth in a state-of-the-art laboratory hidden under an industrial laundry for a million dollars a month. Now separated from Skyler and living in an apartment, Walt admits to her that he has been financing his treatment by cooking meth. Horrified, Skyler asks for a divorce in return for her silence, and demands that Walt have nothing to do with their children. After he discovers Jesse is cooking and selling his own version of the blue meth, Walt agrees to cook his meth for Gus. He is assisted by accomplished chemist Gale Boetticher (David Costabile) and the business seems to be running smoothly. However, Jesse threatens to turn Walt in to the police if he interferes with Jesse's own meth sales, so Walt convinces Gus to hire Jesse to replace Gale as his assistant. Gambling that Skyler will not turn him in to the police due to the harm it would cause to their son, Walt returns to his house. After a few attempts at bluffing him, Skyler comes to uneasily accept the situation and helps Walt launder his drug money, but refuses to have anything to do with him outside of business. The rift in their marriage worsens when Skyler sleeps with her boss, Ted Beneke (Christopher Cousins). Walt tries to get back at her by making a pass at the principal at his school, who puts him on indefinite suspension. Tuco's cousins Marco and Leonel Salamanca (Luis and Daniel Moncada) seek revenge against those responsible for his death, and find out Walt's identity from their uncle Hector Salamanca (Mark Margolis). Believing that Walt betrayed Tuco, they go to his house and prepare to kill him with a silver axe. Gus discovers this, and to protect his investment in Walt, he convinces them to instead target Hank, who actually killed Tuco. The cousins die in the attempt on Hank's life, while Hank survives, but is temporarily paralyzed from the waist down. Skyler strong-arms Walt into paying for Hank's care, and creates a cover story about Walt counting cards at casinos to explain how he made his money. Walt angers Gus by killing two of Gus' dealers in an attempt to protect Jesse, who had been planning to kill them himself for their murder of a child gang member. Gus responds by putting a hit on Jesse and re-hiring Gale as Walt's assistant, with the intention of replacing Walt as soon as possible. Walt plots to kill Gale to avoid becoming disposable, but Gus' henchman Victor lures Walt to the laundry facility, where Mike is waiting to kill him. Walt frantically calls Jesse and tells him that Walt is about to be killed and Jesse will have to take out Gale himself. Victor rushes to Gale's house but finds him shot dead. In the aftermath of Gale's murder, Mike holds Walt at the lab to await Gus' arrival. Victor arrives with Jesse, and proceeds to start the cook process himself to show Gus that Walt and Jesse are not indispensable. Gus, however, kills Victor in front of Mike, Walt, and Jesse, in a gruesome show of force. The tension of working under tighter security creates a rift between Walt and Jesse, and Gus uses the opportunity to bring Jesse to his side by having Mike train him. Walt deduces that Gus plans to eventually kill him and replace him with Jesse. He gives Jesse homemade ricin with which to poison Gus, but Jesse never goes through with it. Walt shows up at Jesse's house and tries to convince him to betray Gus, but Jesse refuses and tells Walt they are finished. Meanwhile, Skyler buys the car wash where Walt used to work and uses it to launder his drug money. Hank suspects that Gus is involved in the blue meth business. With the DEA skeptical and unable to drive due to his condition, he enlists Walt's help in the investigation as a driver and tracker. Walt manages to sabotage the investigation, but Gus blames him nonetheless. Gus rids himself of the Mexican cartel's influence in the area with the help of Mike and Jesse. He then fires Walt and threatens to kill Walt's entire family if he causes any more trouble. Walt tries to use one of Saul's connections to get him and his family relocated, but finds that Skyler has used most of his drug money to pay off Ted Beneke's IRS fines to avoid having their own lives investigated. After arranging for Saul to report that Hank was being targeted for assassination again, so that his family would be protected by the DEA, Walt resolves to kill Gus. When Andrea's son Brock falls desperately ill with ricin-like symptoms, Jesse attacks Walt, believing that he poisoned him. Walt manages to convince Jesse that Gus is the one responsible. After an attempt to kill Gus with a car bomb fails, Walt discovers from Saul that Gus has been visiting Tuco's uncle Hector in his nursing home, to taunt him about the cartel's defeat and the end of the Salamanca family. Walt makes a deal with Hector to draw Gus in by setting up a meeting with the DEA. When Gus comes to the nursing home to kill Hector for turning informant, Hector detonates a pipe bomb Walt made, killing both himself and Gus. Walt rescues Jesse, who had been kept as a prisoner in the lab, and together they destroy all the evidence and torch the lab. After Brock recovers, Jesse learns that the boy had likely been poisoned by accidentally eating Lily of the Valley berries, not ricin. Walt responds that killing Gus was still the right thing to do. Walt calls Skyler to tell her they are safe and that he has "won", as the camera pans to a potted Lily of the Valley plant next to Walt's pool, indicating that Walt had in fact poisoned Brock to goad Jesse into action. Mike attempts to kill Walt in retaliation for Gus' death, but Jesse intervenes and convinces the two men to work together to eliminate their connection to the destroyed lab. The three eventually start a new meth production system with the help of a corrupt pest control company, using residents' homes to cook meth while they are fumigated, using methylamine provided by Lydia Rodarte-Quayle (Laura Fraser), a representative for the conglomerate that owned Gus's franchise. When her supply is discovered to be tracked by the police, she leaks them information on a train carrying the chemical so they can plan a robbery. The robbery is successful, but Todd Alquist (Jesse Plemons), one of the pest control workers, kills a young boy who had seen them. Horrified, Jesse and Mike resolve to leave the business. A Phoenix drug lord named Declan offers to buy out the operation for $15 million in order to remove his competition. Walt convinces him to pay off Jesse and Mike and begin distributing Walt's meth instead. Hank connects Mike to the blue meth, and begins pressing several of his associates, who are now in prison, to give information on the blue meth operation. When Walt delivers Mike's share of Declan's payment, Mike refuses to reveal these prisoners' identities and insults Walt, blaming him for all the problems they've encountered; Walt shoots him dead in a fit of rage. Obtaining a list of the prisoners from Lydia, he enlists Todd's uncle Jack (Michael Bowen), a criminal with ties to the Aryan Brotherhood prison gang, to kill the nine men simultaneously at multiple prisons to prevent the DEA from realizing that they were being targeted until it was too late. After a few months, Walt has earned more than $80 million from meth, and Skyler convinces him to stop. Walter leaves the meth business, and the kids return home. During a family barbecue, Hank finds a copy of Walt Whitman's Leaves of Grass in the bathroom, the same copy given to Walt by Gale; upon reading Gale's handwritten inscription referring to Walt as "the other W.W." and "Heisenberg", Hank realizes that Walt is the drug lord he has been pursuing. Hank accuses Walt of being Heisenberg, which a stunned Walt neither confirms nor denies. Walt says that his cancer is back and he will likely be dead in six months, making an arrest pointless. Hank says they can talk if Walt gives up his children, but Walt refuses and tells Hank to "tread lightly". Walt eventually forces Hank to remain silent by crafting a fake confessional videotape in which he states that Hank is Heisenberg. Walt buries his money in seven barrels on the Tohajiilee Indian Reservation, and convinces Jesse to go into a relocation program. While waiting to be picked up, Jesse figures out that Walt poisoned Brock. Hank approaches Jesse and offers to help bring down Walt. With Hank's help, Jesse lures Walt into a trap by claiming to have found his money. Walt makes arrangements with Jack and his men to kill Jesse, in exchange for promising to help teach Todd how to cook meth. When Walt realizes Jesse is with Hank, he tries to call off the deal to protect Hank, but is subdued by Hank and his DEA partner Steven Gomez (Steven Michael Quezada). Just then, Jack and his men arrive and fire on the group, killing Gomez and wounding Hank; Jack then executes Hank, despite Walt pleading for his brother-in-law's life. Jack's men take all but one barrel of Walt's money and abduct Jesse; as Jesse is taken away, Walt spitefully tells him that he watched Jane die. Walt tries to persuade Skyler and Walter Jr. to go on the run with him, but they refuse. He kidnaps Holly, but has a moment of conscience and leaves her to be found and returned. He calls Skyler, knowing that the police are listening in, and berates her for failing to follow his orders, as a way of clearing her of involvement in his crimes. Walt then goes into hiding and is sent to live in isolation in New Hampshire. After several months alone, Walt goes to a local bar, where he calls Walter Jr. and tries to give him money. Walter Jr. angrily rejects the gesture, however, and hangs up. Feeling hopeless, Walt calls the DEA and gives himself up. As he waits for them, however, he sees Gretchen and Elliott on Charlie Rose dismissing his contributions to Gray Matter, and he is determined to return to Albuquerque to put things right. When Walter arrives in Albuquerque – on his 52nd birthday – he intimidates Gretchen and Elliott into putting his remaining money into a trust fund for Walter Jr. He then visits Skyler and gives her the location of Hank's body so she can clear herself as a suspect in his death, and finally admits to her that he entered the meth business for himself, not his family. As a token of appreciation, Skyler lets him see his children one last time. He then arranges to see Lydia, secretly poisoning her with ricin after learning where Jack has taken Jesse. Walt drives to Jack's compound and demands to see Jesse. When they bring Jesse, who has been chained up in a lab and forced to cook meth since his abduction, Walt dives atop him while simultaneously starting a remote machine gun mounted in his car that kills most of Jack's men. Walt and Jesse kill Jack and Todd. Walt urges Jesse to kill him, but Jesse tells him to do it himself. Walt then finds that he has been mortally wounded by a stray bullet. He answers a call from Lydia on Todd's phone and coldly informs her that she is going to die because he poisoned her with ricin. He exchanges a knowing nod with Jesse, who escapes the compound. Walt takes a moment to admire the lab equipment Jesse had been using, and collapses on the floor just as the police arrive. You're going to see that underlying humanity, even when he's making the most devious, terrible decisions, and you need someone who has that humanity – deep down, bedrock humanity – so you say, watching this show, 'All right, I'll go for this ride. I don't like what he's doing, but I understand, and I'll go with it for as far as it goes.' If you don't have a guy who gives you that, despite the greatest acting chops in the world, the show is not going to succeed. Breaking Bad creator Vince Gilligan cast Bryan Cranston for the role of Walter White based on having worked with him in a sixth season episode of the science fiction television series The X-Files, where Gilligan worked as a writer. Cranston played an anti-Semite with a terminal illness who took Fox Mulder (David Duchovny) hostage. Gilligan said the character had to be simultaneously loathsome and sympathetic, and that "Bryan alone was the only actor who could do that, who could pull off that trick. And it is a trick. I have no idea how he does it." AMC officials were initially reluctant with the casting choice, having known Cranston only as the over-the-top character Hal on the comedy series Malcolm in the Middle and approached actors John Cusack and Matthew Broderick about the role. When both actors declined, the executives were persuaded to cast Cranston after seeing the X-Files episode. Cranston contributed a great deal to the character's persona. When Gilligan left much of Walter's past unexplained during the development of the series, the actor wrote his own backstory for the character. At the start of the show, Cranston gained 10 pounds to reflect the character's personal decline. He had the natural red highlights of his hair dyed a regular brown. He collaborated with costume designer Kathleen Detoro on a wardrobe of mostly neutral green and brown colors to make the character bland and unremarkable, and worked with makeup artist Frieda Valenzuela to create a mustache he described as "impotent" and like a "dead caterpillar". Cranston also repeatedly identified elements in scripts where he disagreed with how the character was handled, and would go so far as to call Gilligan directly when he could not work out disagreements with the episode's screenwriter(s). Cranston has said he was inspired partially by his father for how Walt carries himself physically, which he described as "a little hunched over, never erect, [as if] the weight of the world is on this man's shoulders". In contrast to his character, Cranston has been described as extremely playful on set, with Aaron Paul describing him as "a kid trapped in a man's body". Gilligan has said it has been difficult to write for Walter White because the character is so dark and morally questionable: "I'm going to miss the show when it's over, but on some level, it'll be a relief to not have Walt in my head anymore." As the series progressed, Gilligan and the writing staff of Breaking Bad made Walt more and more unsympathetic. Gilligan said: "He's going from being a protagonist to an antagonist. We want to make people question who they're pulling for, and why." Cranston said by the fourth season: "I think Walt's figured out it's better to be a pursuer than the pursued. He's well on his way to badass." Regarding White's fate in the series ending, Cranston foresaw it as "ugly [with no] redemption", although earlier, Gilligan divulged his plans to "end on a high note, in a way that will satisfy everyone". The character development of Walter White, as well as Bryan Cranston's performance, has received near-universal acclaim, from both critics and audiences. Walter White is considered to be one of the greatest and most iconic characters in television history. Since watching [the fifth season episode, "Confessions"], I've been thinking a lot about Walter White, the 'shadow' on his recent CAT scan, and the black cloud that has long since overtaken his heart. The closer we get to the end, the more Walt scrabbles around and lashes out like a rat when it's surrounded, the less I'm buying Vince Gilligan's whole 'Mr. Chips to Scarface' quote as an analogy for Walt's transformation. That's the route the character has taken these five seasons, sure, in terms of his changing context. But I think the most horrifying part of Breaking Bad may be that Walt, at his core, didn't really transform at all. It wasn't greed or generosity or cancer or fear that fueled this reign of death and destruction. It was resentment. Seething, burning resentment, the kind that forms not due to poor treatment but due to an innate knowledge that you, the aggrieved, are better than said treatment, better than everyone who has somehow gotten the better of you over the years. ... Every moment Walt spent in front of a classroom he was thinking about how beneath him it all was. He was a genius; he was meant to be a millionaire, not this castrated cross between stepping stone and doormat. When you got down to it, Walt desperately wanted to teach every one ... a lesson, and I don't mean in the style of Mr. Chips. Similarly, Scott Meslow wrote in The Atlantic that Walt's capacity for villainy was present well before the series even began, and that cancer was merely the catalyst: "all the elements that have since turned him into a monster were already in place." New York magazine writer Emma Rosenblum said Bryan Cranston "pulls off the unassuming White with flawless subtlety: a waxy pallor, a slump of the shoulders, and a sense of doom that is palpable". The Hollywood Reporter writer Tim Goodman praised as courageous Vince Gilligan's decision to transform Walter White into an unsympathetic character: "You don't take your main character and make him unlikable. You just don't. Nobody does that. Nobody has ever really done that to this extent." Robert Bianco of USA Today called Walt "one of the greatest dramatic creations ever to grace our TV screens". In 2011, the New York Times named Cranston as one of the "eight actors who turn television into art". Following the show's conclusion, actor Anthony Hopkins wrote a fan letter to Cranston, wherein he praised the show and called Cranston's performance as Walter White the best acting he had ever seen. At the annual Golden Globe Awards, Cranston has been nominated for the Best Actor – Television Series Drama accolade on four occasions for his role in Breaking Bad, in 2011, 2012, 2013 and 2014, winning in 2014 for the second half of season five. 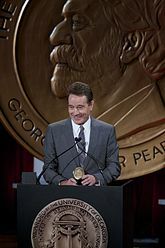 At the Screen Actors Guild Awards, Cranston has been nominated for Male Actor in a Drama Series five times, in 2010, 2011, 2012, 2013 and 2014, winning in 2013 and 2014, for both parts of season five. Also, Cranston has been nominated with the rest of the cast for Performance by an Ensemble in a Drama Series, in 2012, 2013 and 2014, winning in 2014. In addition, Cranston has won the Satellite Award for Best Actor: Drama Series three times consecutively, in 2008, 2009 and 2010, for seasons one, two and three, and has been nominated in 2011, 2012 and 2014 for seasons four and five. He won the TCA Award for Individual Achievement in Drama in 2009, and was nominated in 2010, 2012 and 2013; was nominated twice for the Prism Award for Best Performance in a Drama Series Multi-Episode Storyline; won two Saturn Awards for Best Actor on Television in 2012 and 2013 (tying with Kevin Bacon for The Following on the latter occasion), and was nominated in 2009, 2010 and 2011; and won the Golden Nymph Award for Outstanding Actor in a Drama Series in 2013. Over time Walter White has developed a cult following, spawning fan websites like "Heisenberg Labs", "Walt's Wardrobe", and "Save Walter White", which is an exact replica of the website Walter White's son creates in the series to raise money to pay for his father's cancer treatments. A platform-style Breaking Bad video game has been created as a tribute to Walter White. In 2015, series creator Vince Gilligan publicly requested fans of the series to stop reenacting a scene in which Walt angrily throws a pizza on his roof after Skyler refuses to let him inside; this came after complaints from the home's real-life owner. Cranston reprised his role of the character in a commercial for Esurance which aired during Super Bowl XLIX, one week before the premiere of Breaking Bad spin-off Better Call Saul. A Breaking Bad fan group placed a paid obituary for Walter White in the Albuquerque Journal on October 4, 2013. On October 19, 2013, actor Jackamoe Buzzell organized a mock funeral procession (including a hearse and a replica of Walt's meth lab RV) and service for the character was held at Albuquerque's Sunset Memorial Park cemetery. A headstone was placed with a photo of Cranston as Walt, which is permanently located on an outside wall at the address 6855 4th St NW Los Ranchos de Albuquerque in New Mexico. While some residents were unhappy with the makeshift grave-site for closure with the show, tickets for the event raised over $30,000 for a local charity called Albuquerque Healthcare for the Homeless. Many fans of Breaking Bad, including actor Norm Macdonald and New York magazine writer Emily Nussbaum, proposed a theory, in which most of the series finale happened in Walt's mind, and he really died in the stolen Volvo in the beginning of it. While Nussbaum merely stated that it would be her preferred ending, Macdonald emphasized the seemingly unreal scenarios of Walt's final day, as well as what he deemed as unreliable acting. However, series creator Vince Gilligan debunked this theory, explaining that Walt could not possibly have known several things that happened, like Jesse being held in captivity by Jack's gang instead of being murdered by them, or that Todd had begun taking meetings with Lydia regarding the meth trade. On December 10, 2016, Cranston appeared as Walt on Saturday Night Live's Weekend Update segment to announce that President-elect Donald Trump had selected him to be head of the DEA. ^ a b c Woodward, Richard B. (July 20, 2011). "Breaking Bad: Better Television Through Chemistry". The Huffington Post. New York City: Huffington Post Media Group. Archived from the original on November 13, 2012. Retrieved July 23, 2011. ^ a b c Bowman, Donna (April 12, 2009). "Breaking Bad: 'Peekaboo'". The A.V. Club. Chicago, Illinois: Onion, Inc. Retrieved March 30, 2017. ^ O'Neal, Tom (March 14, 2011). "'Breaking Bad' tragedy: Bryan Cranston can't make Emmy history". Los Angeles Times. Los Angeles, California: Tronc. Archived from the original on October 5, 2011. ^ a b c d Segal, David (July 6, 2011). "The Dark Art of 'Breaking Bad'". The New York Times. New York City: New York Times Company. Archived from the original on July 25, 2011. Retrieved July 25, 2011. ^ Roxborough, Scott (October 2, 2013). "Meet Walter Blanco: Breaking Bad Gets Spanish-Language Version". The Hollywood Reporter. Los Angeles, California: Eldridge Industries. Archived from the original on October 4, 2013. ^ a b Gustini, Ray (July 13, 2011). "You Can Totally Still Catch Up on 'Breaking Bad' Before the Premiere". The Atlantic. Boston, Massachusetts: Emerson Collective. Archived from the original on July 17, 2011. Retrieved July 23, 2011. ^ Hughes, Jason (February 25, 2008). "Breaking Bad: Gray Matter". TV Squad. Archived from the original on May 13, 2012. Retrieved July 22, 2011. ^ a b Amitin, Seth (April 13, 2009). "Breaking Bad: "Peekaboo" Review". IGN. San Francisco, California: j2 Global. Archived from the original on July 25, 2011. Retrieved July 24, 2011. ^ Sepinwall, Alan (April 13, 2009). "Breaking Bad, 'Peekaboo': Jesse collects a debt". The Star-Ledger. Newark, New Jersey: Advance Publications. Archived from the original on July 24, 2011. Retrieved July 23, 2011. ^ Sepinwall, Alan (January 20, 2008). "Breaking Bad: This guy walks into an oncologist's office..." The Star-Ledger. Newark, New Jersey: Advance Publications. Archived from the original on July 22, 2011. Retrieved July 22, 2011. ^ Bowman, Donna (January 22, 2008). "Breaking Bad: "Pilot"". The A.V. Club. Chicago, Illinois: Onion, Inc. Archived from the original on July 22, 2011. Retrieved July 22, 2011. ^ Owen, Rob (January 20, 2008). "Tuned In: 'Breaking Bad'". Pittsburgh Post-Gazette. Pittsburgh, Pennsylvania: Block Communications. Archived from the original on July 22, 2011. Retrieved July 22, 2011. ^ Porter, Rick (July 16, 2011). "'Breaking Bad': Betsy Brandt says Marie and Hank have 'a tough road' in Season 4". Zap2it. Chicago, Illinois: Tribune Media Services. Archived from the original on July 25, 2011. Retrieved July 24, 2011. ^ Chris Hardwick, Vince Gilligan, Julie Bowen (August 11, 2013). "Talking Bad (episode 1)". Breaking Bad. AMC. ^ a b Sepinwall, Alan (March 6, 2009). "Sepinwall on TV: Bryan Cranston talks 'Breaking Bad' season two". The Star-Ledger. Newark, New Jersey: Advance Publications. Archived from the original on July 25, 2011. Retrieved July 25, 2011. ^ Weingus, Leigh (July 16, 2012). "'Breaking Bad': John Cusack, Matthew Broderick Turned Down Walter White Role". The Huffington Post. New York City: Huffington Post Media Group. Archived from the original on June 5, 2013. Retrieved October 9, 2013. ^ a b Rosenblum, Emma (March 13, 2009). "Bleak House". New York. New York City: New York Media. Archived from the original on July 25, 2011. Retrieved July 25, 2011. ^ Bowles, Scott (July 13, 2011). "'Breaking Bad' shows man at his worst in Season 4". USA Today. Mclean, Virginia: Gannett Company. Archived from the original on July 27, 2011. Retrieved July 26, 2011. ^ Ginsberg, Merle (July 16, 2011). "'Breaking Bad' Star Bryan Cranston on Walter White: 'He's Well on His Way to Badass' (Q&A)". The Hollywood Reporter. Los Angeles, California: Eldridge Industries. Archived from the original on July 27, 2011. Retrieved July 26, 2011. ^ Jeffery, Morgan (February 25, 2013). "Bryan Cranston on 'Breaking Bad' end: 'There's no redemption'". Digital Spy. London, England: Hearst Magazines. Archived from the original on March 31, 2013. Retrieved March 20, 2013. ^ Jeffery, Morgan & Wotton, Jamie (May 14, 2012). "'Breaking Bad' Vince Gilligan Q&A: 'I want UK fans to see the show'". Digital Spy. London, England: Hearst Magazines. Archived from the original on February 28, 2013. Retrieved March 20, 2013. ^ Greenwald, Andy (August 26, 2013). "Breaking Bad Season 5, Episode 11 Recap: Cigs, Lies, and Videotape in 'Confessions'". Grantland. Archived from the original on August 29, 2013. Retrieved October 9, 2013. ^ Meslow, Scott (August 31, 2012). "The Big Secret of 'Breaking Bad': Walter White Was Always a Bad Guy". The Atlantic. Boston, Massachusetts: Emerson Collective. Archived from the original on May 15, 2014. Retrieved May 3, 2014. ^ Goodman, Tim (July 13, 2011). "'Breaking Bad': Dark Side of the Dream". The Hollywood Reporter. Los Angeles, California: Eldridge Industries. Archived from the original on October 30, 2013. Retrieved August 10, 2013. ^ Bianco, Robert (August 8, 2013). "'Breaking Bad': You'll be astonished -- again". USA Today. Mclean, Virginia: Gannett Company. Archived from the original on August 10, 2013. Retrieved August 10, 2013. ^ "The High Art of TV". The New York Times. New York City: New York Times Company. September 8, 2011. Archived from the original on January 17, 2017. ^ Moaba, Alex (October 14, 2013). "Anthony Hopkins' Awesome Letter To 'Breaking Bad'". Huffington Post. New York City: Huffington Post Media Group. Archived from the original on October 18, 2013. ^ a b c "Bryan Cranston: Awards". Archived from the original on March 29, 2014. Retrieved April 2, 2014. ^ Couch, Aaron (August 22, 2013). "AMC Drops 'Worst Charity' From 'Breaking Bad' Fundraising Website". The Hollywood Reporter. Los Angeles, California: Eldridge Industries. Archived from the original on March 31, 2016. Retrieved November 8, 2015. AMC created the website in 2009 to mirror the one Walt Jr. (R.J. Mitte) made in a 2009 episode of Breaking Bad to help pay for Walter White's (Bryan Cranston) cancer treatments. ^ Kelley, Seth (March 11, 2015). "'Breaking Bad' Creator Urges Fans to Stop Throwing Pizzas on Walter White's Roof". Variety. Los Angeles, California: Penske Media Corporation. Archived from the original on November 3, 2015. Retrieved November 8, 2015. ^ Adams, Monica (March 12, 2015). "You're Not Walter White, Stop Throwing Pizza on Roofs". News Cult. Archived from the original on November 25, 2015. Retrieved November 8, 2015. ^ Perry, Spencer (February 1, 2015). "Walter White Returns in Extended Esurance Super Bowl Commercial". ComingSoon.net. Archived from the original on September 29, 2015. Retrieved November 8, 2015. ^ Gomez, Adrian (October 4, 2013). "'Breaking Bad' Fan group places paid obituary for Walter White". Albuquerque Journal. Albuquerque, New Mexico: Journal Publishing Company. Archived from the original on December 29, 2013. Retrieved January 11, 2014. ^ Hare, Breeanna (October 22, 2013). "'Breaking Bad': Walter White laid to rest with mock funeral". CNN. Atlanta, Georgia. Archived from the original on January 11, 2014. Retrieved January 11, 2014. ^ Grow, Kory (October 21, 2013). "Walter White Laid to Rest in 'Breaking Bad' Charity Funeral". Rolling Stone. New York City: Wenner Media LCC. Archived from the original on March 27, 2014. Retrieved January 11, 2014. ^ Ellis, Warren (October 3, 2013). "Warren Ellis on Breaking Bad and the Horrible Glory of Heisenberg". Vulture. New York City: New York Media. Archived from the original on January 10, 2014. Retrieved January 11, 2014. ^ Stopera, Dave (October 2, 2013). "Was The "Breaking Bad" Finale All Just A Fantasy In Walter White's Head?". BuzzFeed. Archived from the original on December 4, 2013. Retrieved January 11, 2014. ^ Moaba, Alex (October 3, 2013). "Was The 'Breaking Bad' Finale A Fantasy Playing Out In Walter White's Mind?". The Huffington Post. New York City: Huffington Post Media Group. Archived from the original on October 23, 2013. Retrieved January 11, 2014. ^ "Norm MacDonald Thinks The 'Breaking Bad' Finale Was A Fantasy That Played Out In Walter White's Sick Mind". Uproxx. Culver City, California: Uproxx Media Group. October 2, 2013. Archived from the original on January 11, 2014. Retrieved January 11, 2014. ^ Couch, Aaron (October 16, 2013). "Vince Gilligan Tackles Four 'Breaking Bad' Myths". The Hollywood Reporter. Los Angeles, California: Eldridge Industries. Archived from the original on January 20, 2014. Retrieved January 11, 2014. ^ Gajanan, Mahita (December 11, 2016). "Donald Trump Picks Walter White to Head DEA on 'Saturday Night Live'". Time. New York City: Meredith Corporation. Archived from the original on January 31, 2017. Retrieved January 23, 2017. Egner, Jeremy (March 19, 2010). "On Character: Bryan Cranston in Breaking Bad". New York Times. Retrieved July 13, 2012. "Bit by a Dead Bee"
This page was last edited on 23 April 2019, at 20:07 (UTC).